Regarded by many as one of the best places in the state to watch a high school football game, Pop Keeney Stadium is home to athletic events hosted by Northshore's high schools, Bothell, Inglemoor, and Woodinville, and junior highs, as well as numerous community activities and youth sporting events. Gate time: Ticket sales/gates open two hours prior to game time. The project updates the 40-year-old Pop Keeney stadium, which includes updates to field lighting, replacement of the field turf and visitor stands, as well as the construction of locker rooms, restrooms and concession facilities. 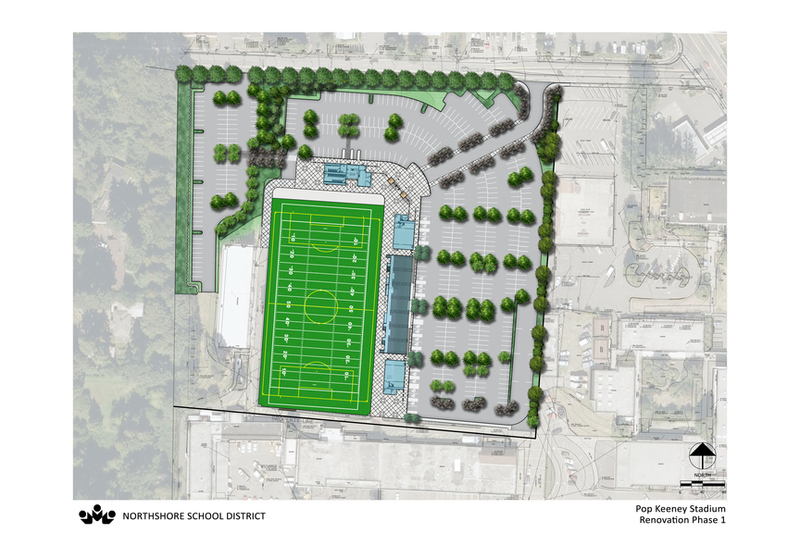 Bothell School Board authorizes removal of old orchard on land adjacent to Bothell-Everett Highway to provide space for the high school football team to practice. Young Harold "Pop" Keeney (1920 graduate of Bothell High) becomes the high school football coach. With the opening of the new Bothell High School, the football field is christened Pop Keeney Field, becoming a community facility. A covered stadium, funded with a voter-issued bond, is completed and becomes the home field for Bothell and Inglemoor High Schools, as well as Woodinville High School when it opened in 1983. The grass field is replaced with artificial turf, after voters authorize the improvement. The community field is now utilized year-round by a variety of district and community groups. Pop Keeney Field is rededicated, commemorating nearly 70 years of community use. Nw state-of-the art scoreboard donated to the district and installed at south end of field. Renovations to Pop Keeney Stadium completed. "Wall of Honor" that recognizes outstanding achievements of Northshore alumni, retired staff and volunteers donated to district and installed at stadium.